Jason Anders: So tell me about growing up in Orange Park, Florida and also about what originally inspired you to become a film director; were you always drawn to the idea of directing music videos? Alan Tanner: I was a huge music video fan in high school. I feel like the early nineties were a great time for videos. I watched a lot of 120 Minutes on Mtv. I remember the first time I saw the Beck "Loser" video. I couldn't believe how cool it was. Beck was carrying a leaf blower on stage, and there were hobos playing guitars, just great stuff. I don't know if I ever actually planned on directing music videos back then, but me and my friends were always coming up with concepts for vids we'd like to see. I wish we had written some of our ideas down. JA: How did you become involved with Saddle Creek Records, making music videos and short films for their website, and what was your favorite weekly movie you produced? AT: A lot of my friends were in bands on Saddle Creek when I was living in Omaha. I started making little shorts with Maria, Conor, and the Tilly kids. Eventually the label asked me if I wanted to take over the weekly movies from my buddy Rob, who had been doing them for a while. It was a lot of fun, but also a real challenge to come up with new stuff every week. My favorite weekly movies were done at the Saddle Creek offices. The Saddle Creek employees are hilarious and always came up with great ideas that I could use, and then pass off as my own. JA: Who inspires you as a filmmaker? AT: Wes Anderson, Hal Ashby, Peter Sellers and Bill Murray. 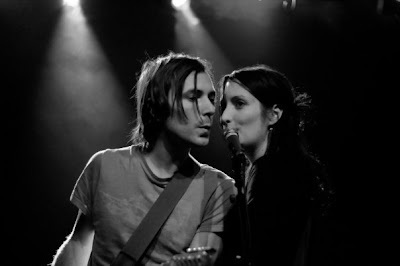 JA: You also play guitar for musician Maria Taylor; how did you become involved with her, and what are a few of your fondest memories traveling with her and being a part of her band? AT: Orenda and Maria are a couple of my best friends. I've known them from way back. Maria asked me if I wanted to play in her band when we were roomies in Omaha. It was a great experience. I think that touring Europe is sort of a dream that every musician has, and I'm so lucky that I got to check it off the list. JA: What are your top three favorite albums of all time? AT: The Beatles' Revolver, Flaming Lips' Hit to Death in the Future Head, The Smiths' The Queen is Dead, Violent Femmes' S/T, and T. Rex's The Slider. Sorry, there's no way I could just pick three. JA: Let's talk about a few of the music videos you have created, starting with your work as Tilly and the Wall's director on the videos "Pot Kettle Black" and "Rainbows in the Dark"; were there any ideas for these videos that were scrapped? Also, what have been your favorite memories working with the band, including the creation of "A Christmas Play". Did you originally meet Neely Jenkins while working with them as a director? AT: I knew Derek and Nick from living in Athens, Georgia, but didn't meet the girls in Tilly and the Wall until I was an extra on their video for "Reckless". Those guys are super fun to work with. With the "Pot Kettle Black" video, I wanted to do sort of an early nineties Sonic Youth/Breeders kind of video, where the band is playing in different locations all over town. It was Kianna's idea to have them pull into a parade in the middle of the video. When she mentioned it initially, I was like "where are we going to get a parade? ", but as luck would have it, Council Bluffs, Iowa had one scheduled at the end of the month. They agreed to let us be in the parade and film. You would never get away with that in LA. "A Christmas Play" was made in like thirty minutes after a sound check for one of their shows. It's one of my favorites. JA: You directed "Souled Out", a music video for Conor Oberst from his self-titled album; what was it like to work with him on this video, and also, which video do you feel showcases your best creative work as a director? AT: Conor really threw me a bone with this video. He's really great about helping out his friends, and getting to direct the first video for his solo record was a big opportunity for me. As far as the concept was concerned, he basically told me to pick a song that I liked off the record, and come up with an idea. Most of the stuff that I do is comedy based, and even though Conor has got kind of a reputation for being a serious dude, he's actually one of the funniest people I've ever been around. I think that's what makes the video work so well. I provided the scenarios, and just filmed the band goofing off in front of the rear projection screen. That's an ideal situation. When the band is having fun, everything works out in the end. JA: A fun music video you directed for Maria Taylor is "Time Lapse Lifeline", where did the idea come from? AT: Maria wanted to do a video that was about her and friends having fun in California. Kind of a road trip style video. I think we had figured out all the locations and wardrobe before we hatched the idea of them vandalizing the city. Our friend Jenny Reyes did an amazing job with the dresses. The girls look so beautiful while smashing mailboxes, and driving their car into garbage cans and such. JA: My favorite video you directed is "See Fernando" for Jenny Lewis; tell me about the production of this short, which is themed to the 1960's spy genre, and also what it was like to work with Jenny Lewis. AT: I came up with the concept without realizing how hard it was going to be to make the video look like a real movie. I watched a lot of old spy movie trailers: Kiss the Girls and Make Them Die, Spy In Your Eye, Kiss Kiss Bang Bang. In all of those trailers there are so many locations and costumes. It was really tough to shoot enough scenes in two days to make it look legit. We had Jenny doing various costume changes in the middle of Chinatown and Downtown Los Angeles. She was a total sport though, and an amazing actor. If the music thing doesn't work out for her, she should really try to pursue a career in acting. JA: Do you see yourself pursuing more of a career as a musician or filmmaker further on up the road, and also, if you had to define your style with just one word, what would that word be? AT: I love playing music, but I don't feel like I was ever that great at it. I think I'll probably stick to making videos and what not. But who knows? One word? Ridiculous, maybe?